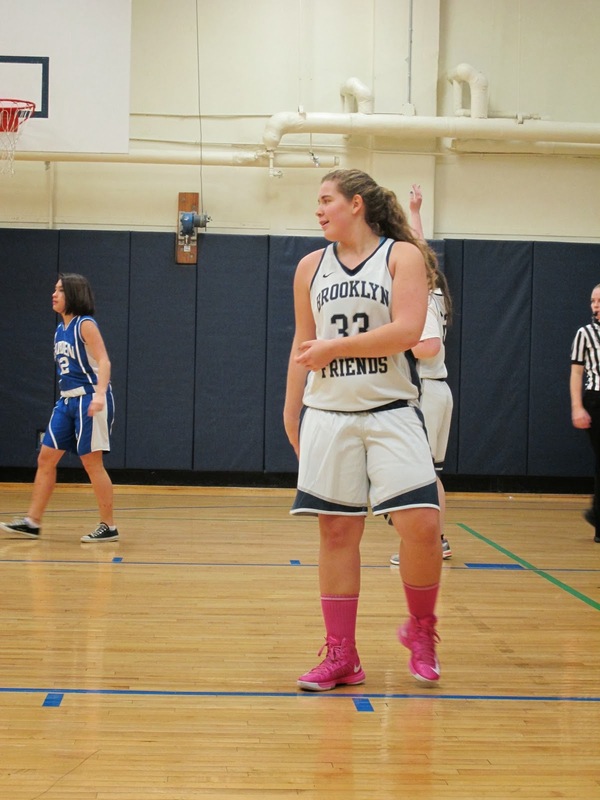 On Tuesday the BFS Girls Varsity Basketball team defeated Rudolph Steiner 28-10 on the road at Pace University. The team was upbeat as they traveled by train just over the bridge for the league contest. Coming off a couple disappointing loses the team had a very strong practice the day before, which they spent the whole time working on their defense. The team go off to a good start against a young Steiner team. BFS managed to score ten first quarter points while holding their opponent scoreless. Four players scored as BFS got everyone involved early. The second quarter was much of the same as BFS took a 17-1 lead into the half. Everyone contributed and on both ends of the court and it looks like the practice the day before that focused on defense paid off. BFS switched things up in the second half falling back into a safe closed two three zone while resting its players as much as possible on the college court. The second half was much closer as BFS outscored Steiner 6-4 in the third quarter and 11-9 during the second half. The victory gave BFS its first league win of the season. It was much needed. BFS knew coming into the season that this was a rebuilding year after losing senior Janna J. who scored over 1,000 points in her career. The team is hoping to find their way on both offense and defense and to compete for a playoff spot this season. Freshman Ivy L. finished with 8 points. 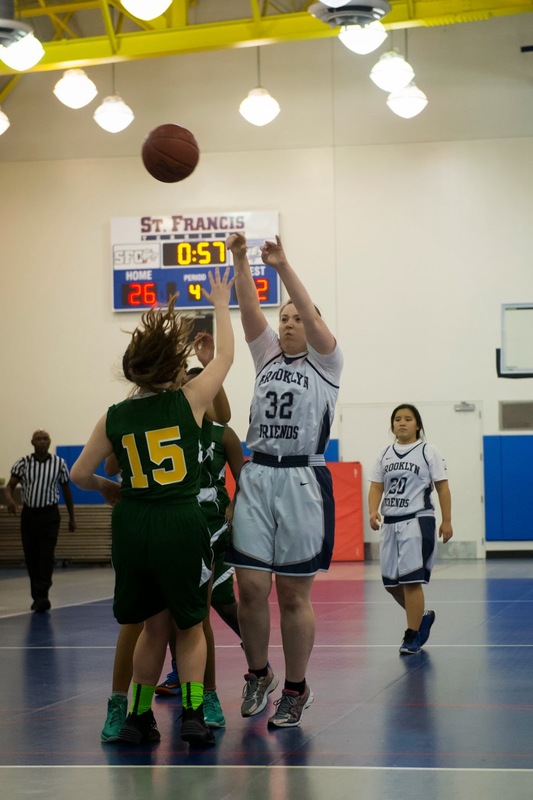 Junior Julia B. had 6 points and 7 rebounds. Sophomore Abby M. finished with 4 points, senior Chloe B. had 3 points, and fellow senior Julia G. had 2 points. Freshman Monet M. scored her first point of her career on the foul line during the fourth quarter. Junior Julia C. was back in action and did a great job while she was on the court. Senior Aria C. was all over the place scoring 4 points and grabbing a team high 11 rebounds. Sophomore Sierra V., our defense specialist was missed, we are hoping to get her back next week. BFS will be back at it today (Wednesday) versus Garden in another league match up. The short handed team is open for the best as it takes on Garden and Churchill this week with two players on a school trip, one currently away from school, one under the weather, and other team members with various commitments. On Wednesday the BFS Girls Varsity Basketball team defeated Garden 33-22 in the lower gym to pick up their second league win in as many days. BFS got off to another good start. The team took and early 12-4 lead after one quarter of play. Junior Julia B. scored six points, senior Julia G. had four, and freshman Ivy L. had two points during the first quarter. Julia B. continued her scoring ways in the second quarter adding five more, while Julia G., and Ivy chipped in with a basket each to give BFS a 21-12 halftime lead. Julia B. played one of her better all around games finishing with 19 total points, 12 reounds, and two assists. Julia G. (5 steals and 4 assists) and Ivy each had 6 points (5 rebounds and 3 steals), and junior Julia C. made a basket for BFS. The team played great team defense again. Even without a couple key players BFS picked up a very nice league win to even their overall record at 3-3 (2-1 in league play). Senior Aria C. once again attacked the board pulling in 7 rebounds. Fellow senior Chloe C. did a good job on both ends of the court. Sophomore more Taty R. gave BFS some solid minutes, while freshman Monet M. continued her overall development on the court. Practice Thursday, next game Friday. The BFS US Boys & Girls Varsity Indoor Track team participated in their first meet of the season up at the 168th Street Armory. Collegiate, Trinity and Sacred Heart. best time ever and showed promise for the races down the road. Maya finished with a time of 2:11.91 good for 23rd place out of 40 total runners. first race at 600M and first race for the season. Miles finished with a time of 1:38.10 good for 12th place out of 34 total runners. demonstration of the athlete’s commitment to the team. Elinor finished with a time of 52.80 good for 53rd place , Sofia ran a time of 54.03 good for 6oth place, and Maya ran a time of 57.00 good for 76th place, out of 90 total runners. front of him as he came down the homestretch to hit the finish line in first. and practices down the line. Miles finished with a time of 40.95 good for 6th place out of 50 total runners. inspire them and other teammates to make the trek up to 168th St.
played it safe when she picked up her second foul early in the game. He did call time out with five seconds to play in the first half and drew up a play for Julia B. and the team ran it to perfection and scored going into the half. No lead is really ever enough. Both teams continued to battle. BFS struggled to put the ball in on offense and their opponent never gave up. They basically played us even during the second half. What a great week for the team. Julia B. finished with a game high 15 points and game high 13 rebounds. Julia G. played one of her more aggressive games, especially on defense. She scored 8 points, including two deep three points, and she also had 7 assists and 4 steals. Fellow senior Chloe B. was great. She played well on both ends of the court, scoring 6 points and finishing with 6 rebounds. Freshman Ivy L. moved her feet and played solid defense , while also helping out on the offensive end with 6 points. Junior Julia C. played a solid overall game, she was very aggressive on offense. Senior Aria C. played her best game of the season. Sophomore Taty R. was much improved on both ends. The team was happy with the win. They are looking forward to next week, practice Monday, games on Tuesday and Wednesday. Blue Pride! !